Gluten and processed grains have been the scrutiny of the health world for the last decade. Some will even tell you that pasta cannot be healthy. But, is there such a thing as healthy pasta? Bread gets a bad rap. And let’s face it – for good reason. Most breads on your grocery store shelves today contain dough conditioners, synthetic vitamins and minerals, loads of sugar and even food dyes and high fructose corn syrup. Paleo, high protein, and carb-less diet fads are on the rise, but is bread truly always unhealthy? Over 6 million children in the United States have some form of food allergy. I traveled to the second poorest country in the western hemisphere last spring, and was shocked to not find one case of allergies and eczema among children who were served rice two of two meals a day in a tin hut home. How can these children, who have no medical advantage, not have eczema and gluten allergies when their staple is a bread product? Ancient societies did eat bread. The book of Ezekiel in the bible (v. 4:9) specified a mixture for bread including barley, wheat, beans, lentils and millet. This concoction yields a product that’s 85% protein, rivaling the content of meats. There is even a company which makes and sells this recipe for bread. A number of societies thrived on bread as their staple. Today, many cultures still have a large amount of their daily food intake supplied by bread. These societies did not have have the chronic illnesses which we have today. Cavemen ate mostly protein.Eskimo tribes thrive on a 95% fat diet. Old Chinese cultures survived off of pure carbohydrates. Chronic illness creeps into societies not because of their high protein, high fat, or even high carbohydrate diet – it is founded when the whole foods are stripped down and processed, fragmented, and enriched. The issue is not bread. It’s what the bread is made of and how it’s made. What’s wrong with our pasta today? Pasta today is grown with GMO wheat, loaded with cancer-causing pesticides. Then, the germ is stripped from the bran, robbing the bread of its main source of nutrients. It is then enriched. Any enriched product means that the nutrients have been taken out, and synthetic ones have been put back in. With a box of spaghetti costing around $1, do you think they’ve replaced those vitamins and minerals with some high quality stuff? Definitely not. Synthetic vitamins and minerals can not only add to the toxic load of the body, they can also block the receptor sites of the natural vitamins or minerals in your cells, causing those needed nutrients to never be used by the body. This leaves you with little nutrients, and a whole lots of chemicals. So, what is the healthiest pasta you can buy? If you cannot tolerate any grains, it’s also a good idea to get a spiralizer and try a vegetable pasta, like zucchini or spaghetti squash. Gluten is not the enemy. In ancient times, homemakers knew how to prepare grains and bake breads with whole grains. All grains and legumes were soaked, fermented and/or sprouted before being used in any dishes. It was known that this improves the digestion, and today we know that this reduces the gluten content and other anti-nutrients, while increasing the nutrient count per bite. Today, our grains are sprayed, stripped and enriched. The processed product we see today is nothing like the healthy product we saw centuries ago. With the processed pastas and breads, we’ve brought those processed ingredients straight into our digestive system. Gluten can be inflammatory in the gut, especially for those who have a sensitivity to it or other toxic burdens on their body. This inflammation causes permeability between the cells of the gut lining, and then allows food particles to pass through the gut lining into the blood stream. In the blood stream, the undigested particles are picked up as immune threats, and the body launches an attack (allergies!). These particles can be detoxed through the skin ( eczema! ), our bodies largest immune organ. Though some are truly sensitive to gluten, others simply have a damaged gut for which steps to a natural, whole food diet may resolve. Cutting out gluten by consuming organic (because those pesticide chemicals travel with the food particles through the gut lining to the blood system), sprouted pasta and bread products may allow the gut to heal, and the person to tolerate gluten once again. Yes, you can! Use a whole ancient, sprouted grain flour (like this one!) and make basic pasta. It may not look perfect, but it may be tasty and if nothing else, a great home school lesson. You can eat pasta – just the right kind! Focusing on eating organic, sprouted ancient grains can bring bread back into your life in a healthy way. 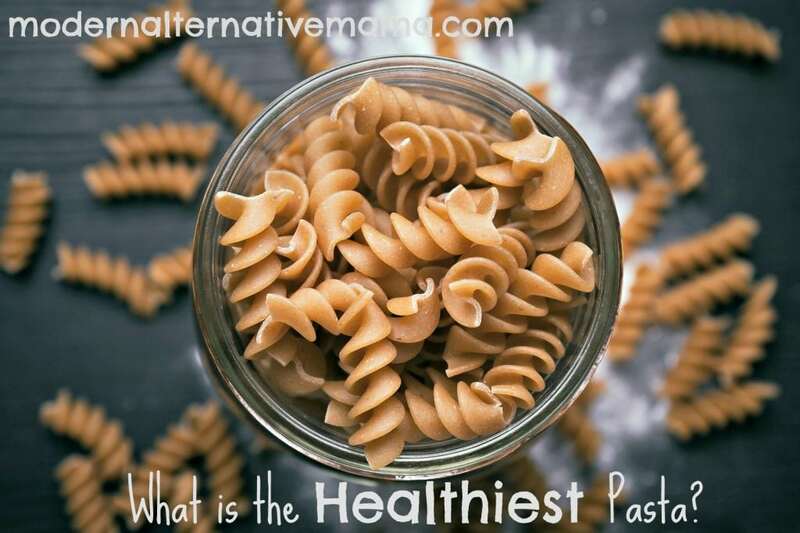 What is the healthiest pasta you have tried?